There will be plenty of freestyle happening as well, so whether your best move is the running man, the sprinkler, or something that suggests I-totally-have-no-idea-how-to-dance-but-I’m-having-a-blast…just go for it! Catch your breath during intermission and enjoy performances by the Next Step dancers, Power House dance, and the Texas Legends dancers. So WHY are we dancing? 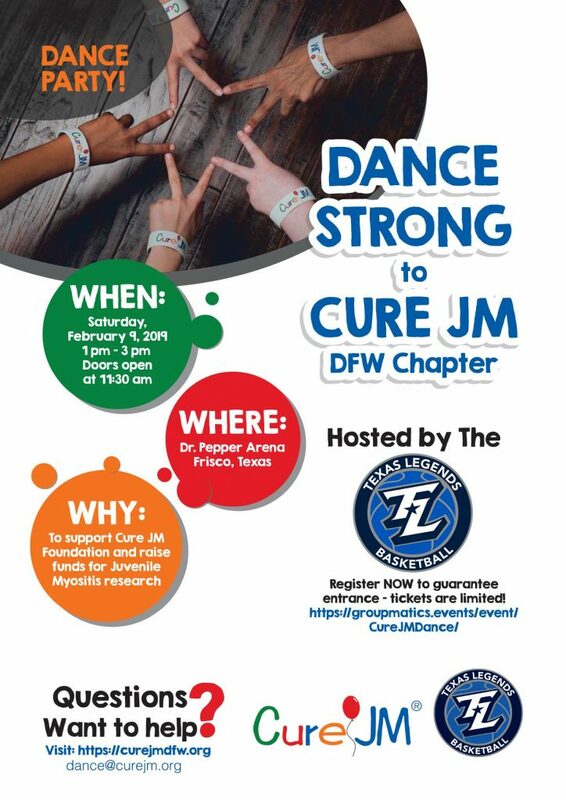 The Texas Legends and the Cure JM Foundation are proud to host the first annual Cure JM Dance for the Cure at Comerica Center (formerly Dr Pepper Arena) this Saturday, February 9 from 1:00 pm – 3:00 pm with food, drinks, prizes, and tons of fun! Tickets include admission to the dance and to the Texas Legends game afterward. 100% of ticket sales go to the Cure JM Foundation. What’s JM? I confess…I didn’t know either until I had a chat with Frisco resident John Kara, who leads the Cure JM Foundation’s DFW Chapter with his wife, Jenny. When you speak to John about JM, it’s evident that his dedication runs deep. If you want to understand the latest updates on research, facts, figures, and statistics, these roll off his tongue. If you want a personal story about how the disease affects a child’s day to day life, this rolls off his tongue even faster. John and Jenny’s daughter, Madeline, was diagnosed with JM at age 7, following months of misunderstood early disease activity. Juvenile Myositis (JM) is a rare and life-threatening autoimmune disease in which the body’s immune system attacks its own cells and tissues. The immune system normally protects the body from infection and other environmental factors. In an autoimmune disease like JM, however, the immune system attacks previously healthy tissues, harming the body instead of protecting it, and mistakenly targeting muscles, skin and other tissues. It’s a rare disease, with approximately 2 to 4 children in a million in the United States diagnosed each year. In Madeline’s case, a series of intense medications have worked well (not every child responds as well). She’s currently in remission and preparing to attend Wakeland High School next year where she’ll continue to foster her passion for music in the marching band. Remission from JM is a blessing, but the journey doesn’t end there. There are a whole host of side effects which are serious and life-altering themselves. Thus, better solutions are still needed. We can’t always choose the music life plays for us, but we can choose the way we dance to it. So how do you draw the community to an event for a cause they’ve never heard of, for a family they don’t know, and without a large corporation, celebrity or professional athlete behind it? That’s the entire point. It’s these lesser-known, rare causes that need our help the most and I believe, Frisco’s got this. Frankly, if a cause like JM can establish a highly attended event in a generous-hearted community like Frisco or if they received the support of a few large corporations, it’s possible that new treatments could be discovered in ten years, rather than within the next 50 to 100 years. The Frisco community can be a part of that! You’d be surprised what a group of passionate advocates can do. To date, Cure JM has raised $11 million. That may sound like a lot, but in the world of medical research, it’s not nearly enough. More than dollars, Cure JM needs exposure. Exposure to donors, corporations, the medical community, and big hearts (like I know we have in Frisco). Of all the things your family could do this weekend, we think this one is a winner. Here are the details. WHAT: A Dance Party! Dance along with the Texas Legends dancers on the court where your Texas Legends play! Catch your breath during intermission and enjoy performances by the Next Step dancers, Power House of Dance, and the Texas Legends dancers. Every attendee will receive a comp ticket to the evening’s Legends basketball game! $5 raffle tickets will be available for purchase as well for entry to win 2 round trip tickets on Southwest Airlines! COST: Tickets are only $10 and kids 18 and under are FREE! (But we hope you’ll consider making an additional donation to acknowledge the efforts, heart, passion, and JM families represented at the event.) Purchase tickets online now, or grab walk-up tickets upon arrival. FOR MORE INFO: Follow the event info on Facebook or contact dance@curejm.org. We can dance. But what else can we do to support Cure JM Foundation? If you’re curious to know more about this worthwhile cause, visit the Cure JM Foundation website. It’s very thorough, offering details about the disease, financials, support for families, treatment and insurance tips, and more. Locally, you can connect with the Cure JM DFW Chapter Facebook page or contact John or Jenny via email.